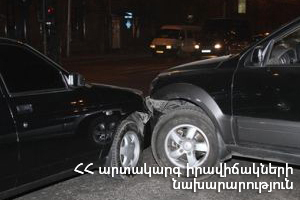 On February 12, at 21:06 an emergency call was received to “911” service that a car accident had occurred on the 1st km of Ashtarak-Gyumri roadway: the rescuers’ help was needed. It turned out that “VAZ-2106” and “Opel” cars had collided. As a result of the accident “Opel” had turned over onto its side: there were no casualties. The rescuers disconnected the automotive batteries and closed the gas valves of the cars and stopped the gas leak from “Opel” car.